After an unconvincing first half in which the best chance came for the visitors in the dying moments of half, India stepped up the gear as they routed Nepal 2-0 in an dominant second half display. Goals from Sandesh Jhingan at the hour mark started the proceeding as Jeje soon followed up with his own to double the score, as a lot of other chances were wasted. 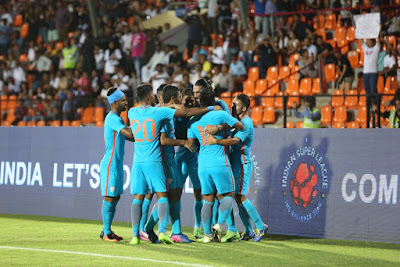 India started in a familiar 4-1-3-2 formation sans Sunil Chhetri and Udanta Singh, who were spotted in the stands recuperating from their injuries. Gurpreet Singh Sandhu led the team while Mohammed Rafique was chosen ahead of Eugeneson Lyngdoh in midfield. Holicharan Narzary and Jackichand started on wings as Robin Singh and Jeje Lalpekhlua led the attack. At the other end, Nepal had Biraj Maharajn to led the side as Rohit chand manned the midfield while young star Bimal Gharti Magar started alongside inform Nawayug Shrestha in the attack. In a cagey first half, three players went down injured early in the game due to collisions, while Md. Rafique and Rohit chand came back on field; Rowlin Borges had to be substituted at the half hour mark with Lyngdoh. 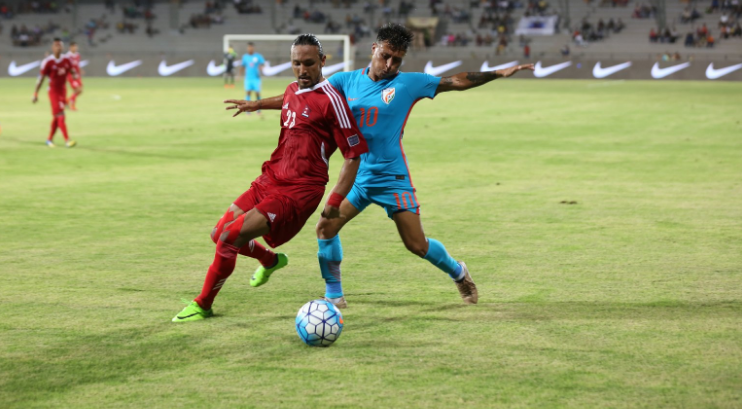 Jackichand Singh and Narzary looked to sent in crosses, one such cross in the 24th minute was met by a leaping Robin Singh but the striker missed the target by inches. Eugeneson Lyngdoh soon created a good move with some slick passing with Jeje but failed to finish off as Nepal’s Anant Tamang put in a timely block. Few minutes later Robin Singh once again failed to connect properly from a promising position as another chance went to waste. By the end, Nepal had the best chance of the half to open the scoring. A quick counter attack saw Nawang Shrestha running with the ball shrugging off his mark Anas but as Gurpreet came off his line to block the shot, Shrestha fluffed up the chance has the ball went wide. Both sides entered the tunnel without opening the score. Looking to turn things around Constantine brought on Jairu and Daniel Lalhlimpuia in place of Jackichand and a wasteful Robin Singh. Soon Jairu looked threatening with his pace on the right as his first low shot was denied by Kiran Kumar diving to his right. 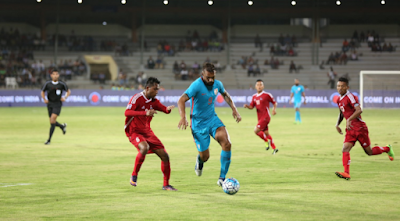 Finally at the hour mark India broke the deadlock as Jeje brilliantly chested the ball for defender Sandesh Jhingan, who slammed the ball past the diving keeper into the net, to open the scoring. Few minutes later in a quick counter attacking move Gurpreet’s long goal kick found Jairu running with ball in to the box but Nepal skipper Bimal Maharjan brought down the winger just outside the box. Maharajan was given his marching orders as the visitors were down to ten men. The resulting freekick turned out to be poor as India failed to capitalise on the chance. In the 78th minute, Mohammed Rafique burst out from the right flank and his low cross into the box was slotted past the Nepal Keeper by an onrushing Jeje with a clinical first touch to double the lead. Second half substitute Daniel Lalhlimpuia too missed few chances like Robin Singh as the youngster came close to scoring his first goal. India gained a much needed momentum as they won their sixth consecutive international game before the big game next Tuesday for the 2019 AFC Asian Cup qualifier against the Kyrgyz Republic in Bengaluru.